KC Plant Limited, a new plant hire company based in Watford in Hertfordshire, has purchased the first Bobcat R-Series E26 2.5 tonne and E27z 2.7 tonne mini-excavators in the UK. 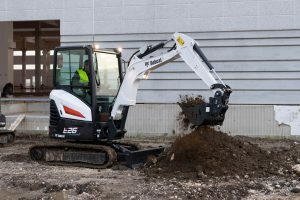 The E26 and E27zs are part of an order placed with Bobcat for 18 mini-excavators, including the company’s popular E17z 1.7 tonne and E85 8 tonne models as well as Bobcat hydraulic breakers. 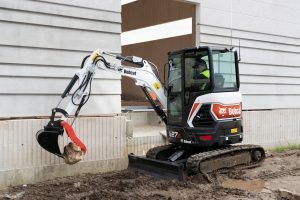 The E26 and E27z are part of Bobcat’s new R (Revolutionary)-Series mini-excavators from 2-4 tonne, comprising three more models – the E27, E34 and E35z – all five machines offering a best-in-class mix of high digging forces, superb stability and smooth controllability of working functions complemented by low weights for easy transportation. 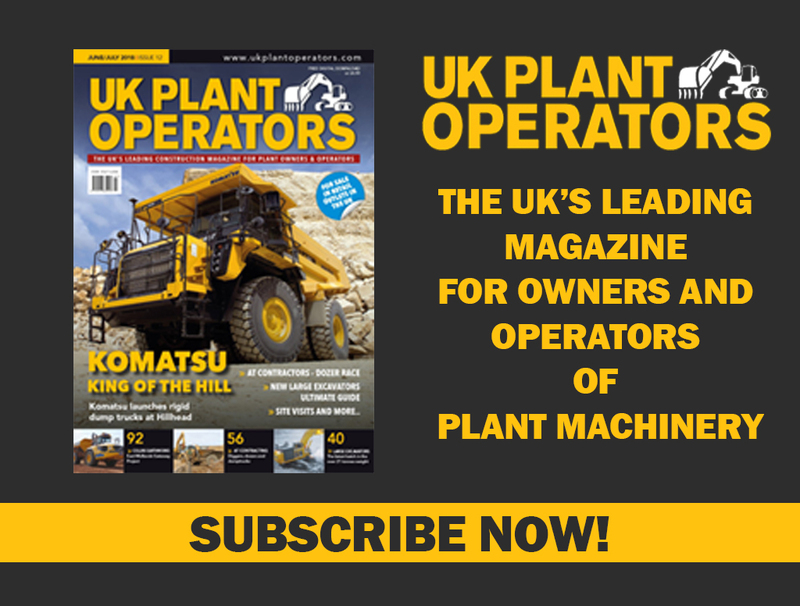 Rob Allenby, owner of KC Plant, commented: “I’m delighted with the new Bobcat machines and they have been very well received by our customer base. The build quality and the design of the new E26 and E27z are excellent. We have taken the canopy version of the E26 and the long arm version of the E27z zero tail swing (ZTS) model, which has a new cab that is the largest for this size of machine on the market. The new R-Series E26 mini-excavator with a canopy and bucket has an operating weight of 2490 kg, a maximum digging depth of 2568 mm and maximum reach at ground level of 4413 mm. The new E27z mini-excavator with the cab and bucket has an operating weight of 2700 kg, a maximum digging depth of 2847 mm and maximum reach at ground level of 4814 mm. The new generation R-Series E26 is an easy-to-use, robust machine optimized for rental industry needs while introducing the next level of operator comfort and features required by demanding owner-operators. The E26 excavator has a transport weight reduced by 100 kg but increased over-the-side lifting capacity. To overcome a common issue in the rental market and thus protect the uptime, the E26 is also equipped with extra innovative features such as the Cylinder-Inside-Boom (CIB) workgroup and its geometry, increasing protection against bucket collision with the cab. Like all of the new R-Series machines, the larger operator space and premium interior in the E27z cab deliver best-in-class comfort with an improved entry/exit thanks to new ergonomic 3D handles and a wider door. The new cab also features significantly larger windows and narrower pillars giving market-leading all-around visibility. In addition, in the new E27z, the ZTS functionality is taken a level further using Bobcat’s Zero House Swing (ZHS) design, in which the front upper structure is also fully protected by ensuring the front corners are kept within the swing circle and inside the tracks. As a result, the ZHS functionality on the E27z provides the peace-of-mind of 320° of free rotation when working close to walls and other obstructions, without sacrificing on operator comfort or performance, giving users the benefit of 20% more freedom of movement than with a classical ZTS. Rob Allenby added: “This is an important feature for hire companies – as a trueZHS machine, the E27z offers the highest flexibility of movements when working close to walls, coupled with best-in-class 360-degree stability and a low weight for easy transportation. Inside the low noise-low vibration cab, the operator has the benefit of new joysticks and new optimized metal travel pedals. The new minimal effort joysticks offer further enhanced controllability and smoothness of working functions. Like the E27z, the E17z is also a ZHS model – it has a standard operating weight of 1749 kg and a maximum digging depth of 2249 mm. The compact size combined with great stability and a transport weight close to 1.6 tonne makes this machine the perfect choice for applications in confined areas. The larger E85 model (including cab/rubber tracks/long arm) has an operating weight of 8600 kg, a maximum digging depth of 4625 mm and maximum reach at ground level of 7430 mm.